Many people today could readily identify the iconic character Big Bird, but most of them may not necessarily associate this famous “Sesame Street” cast member with the EQ (Emotional Quotient) characteristic of Commitment. Yet Big Bird—well, that is to say Caroll Spinney—exemplifies the essence of LEADon’s® definition of Commitment, and he has left a legacy the rest of us could follow. Caroll Spinney might not be as well-known as his giant feathered friend or his equally celebrated Oscar the Grouch, but this puppeteer and veteran actor gave life to these two beloved Muppets during thousands of television episodes. Spinney became enamored with puppets as a child and worked in several venues as a puppeteer before joining forces with Jim Henson in 1969. Their collaboration and Spinney’s commitment to his work obviously payed off since the minor role Big Bird was supposed to play in the late 60’s morphed into a regular, renowned member of “Sesame Street.” After nearly fifty years of dedication to this children’s television broadcast, Spinney retired in October, 2018 (read more about Caroll Spinney in Dave Itzkoff’s article at https://www.nytimes.com/2018/10/17/arts/television/sesame-street-big-bird.html). Align your personal goals to support your team and Corporate Family® to meet or exceed objectives. Align your personal goals for the betterment of your spouse, significant other, and/or children. It’s important to note that you have a choice regarding this alignment process—no one can force you to do so. This is a decision you make because you realize, in the end, this type of Commitment benefits you too. In other words, everyone should have a chance to become more successful because of the choice(s) you make to adjust your own desires/plans/goals for the greater good. Sometimes you will realize that making such adjustments isn’t easy. Spinney admitted at times he felt lonely and isolated while playing Big Bird and Oscar the Grouch. Yet he found a way to stay motivated and carry on. In other instances, you may discover your standards of Commitment do not match the culture of a particular team or Corporate Family®. It is in these circumstances that you may need to consider “aligning” with another group or organization. What’s a good way to know you are in the right place, doing the right thing? Here’s how Itzkoff ended his article on Spinney: “In some form or another, he plans to remain an ambassador of ‘Sesame Street,’ at conventions and other public appearances. ‘I’ll be 100 years old, doing Muppet stuff.’” So, take a moment to consider this question: Is your dedication to your team, group, or organization so strong that you would still want to help them in some way, even if you had to move, transfer, or retire? If the answer is yes, you are in a good place, doing exactly what you should! Finally, many people in the 21st century recognize that spending five decades in a single organization may not even be possible. Companies of all shapes and sizes change over time. Some even cease to exist. Others are acquired. Employees need to relocate for multitudes of reasons. Yet, despite these external circumstances, Commitment actually defines who we are as individuals. As one of twenty-five essential components of EQ, Commitment exemplifies our personal competence and self-motivation, revealing our true inner character. LEADon’s® online assessment, the Developing Emotional Competency Questionnaire (DECQ®), is a great place to begin identifying how you score in all twenty-five EQ characteristics, including Commitment. In addition, we recommend taking LEADon’s® online course entitled LEADing with Hall of Fame LEADership® (www.LEADonUniversity.com) where you will discover specific strategies on how to develop Commitment in your personal and professional life. Also, please contact the LEADon® team at 858.592.0700 or www.LEADonUniveristy.com if we can assist you or your Corporate Family® with any leadership needs. 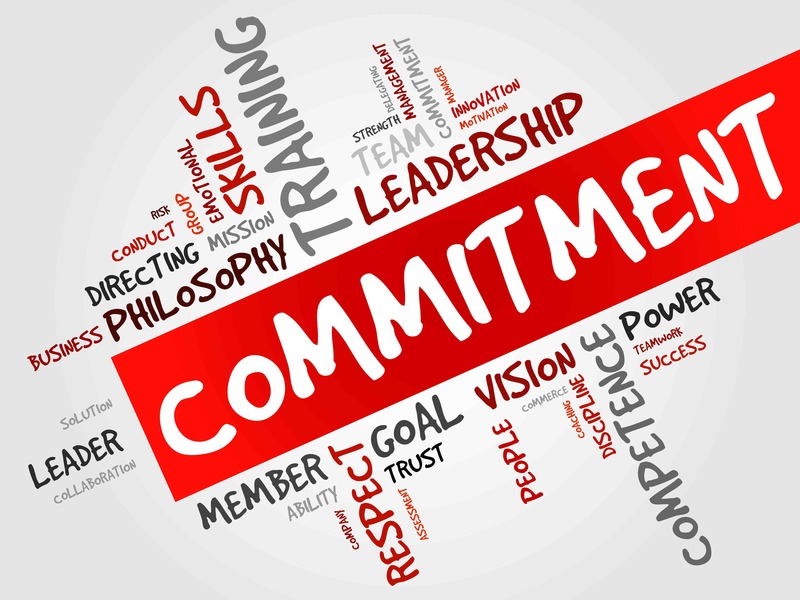 Your intentional effort to address the EQ characteristic of Commitment will truly be of benefit to you, your team, and your entire sphere of influence. Who knows, perhaps like Caroll Spinney, you will have an impact on generations of individuals and leave a lasting legacy that others will want to follow.